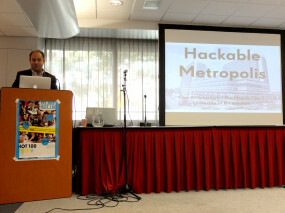 Amsterdam Hackable Metropolis was invited to contribute to the 2013 Hot100 program, a workshop with the best alumni in the arts, media and technology, which took place on Friday the 27th of September in the framework of Today’s Art Festival. So far an initiative of Virtueel Platform, this year it is the first time that Hot100 is organised by The New Institute, only to become more rich and multidisciplinary. Five teams were invited to provide a question about the future of media and architecture: AVRO asked what should be done with their new building in the heart of Vondelpark in Amsterdam to involve the public in their future broadcasting programs. The Dutch Electronic Arts Festival and V2 set out to explore what it means to be an artist in a time when the borders between art, technology and science become increasingly harder to establish. A Museum Studio by The New Institute questioned the ways museums communicate with their audiences and invited ideas on how they can create more inclusive exhibition experiences in the future. 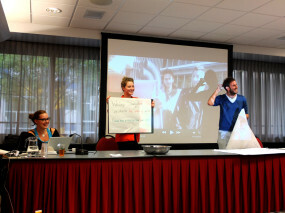 Stichting Toekomstbeeld der Techniek put forward a question about the future of education by asking participants to imagine the typical day of a student in 2020 in a multidisciplinary school. Media-architecture such as urban screens and media facades can alter the ambience of an environment. As such there is nothing new about the use of media surfaces in architecture (think stained glass windows in Cathedrals, or the 1970s Las Vegas’ signs being more important than the buildings themselves as landmark and visual points of reference), however a software layer is much more malleable than the ‘hard coded’ media surfaces of earlier eras. It can adapt either through pre-programmed alternations, or by real-time input from all kinds of sensory data. Urban sensing: buildings can start collect information with all kinds of sensors that record and process data. This data can be used for long-term processes such as input for spatial planning, or for real-time interventions in the programming of a site. Media Interfaces that appropriate buildings in new ways. The program or function of a building can sometimes be reprogrammed through the use of online interfaces. For instance, thanks to Airbnb, a suburban apartment can become a temporary hotel room, and the whole city can become a distributed hotel. On a different level, flash mobs are examples of how people organize themselves collectively through online interfaces to temporarily take over a space. In other words: the metadata of a space starts to play a role in the spatial / functional programming of cities. As a consequence some institutions might do without a centralized presence on one recognizable site. Rather, their website becomes their lobby, directing visitors or customers to temporary locations. De Waal challenged participants to make use of these technological affordances of new media, and asked how they might lead us to rethink what is a public space. For instance, we are used to think of public spaces as contrasted to private ones: Public spaces are (literally) open to and accessible by all and associated with a feeling of diversity and emergence due to unpredicted encounters that take place there. However we usually don’t think of enclosed empty buildings as public spaces, they usually fall under a real estate regime. But can we make use of new media to (temporarily) start to program these places as public sites? We worked with an interesting group of students, a promising mix of industrial and interactive designers, architects, graphic, communication and game designers. The first part of the workshop was a brainstorming session recognising the most important and interesting topics around the question. 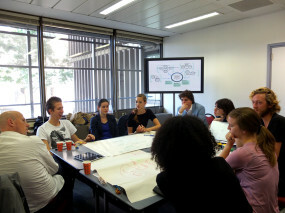 Students brought up issues concerning the use of new media by subcultures that allows for the disconnection of the cultural from the geographical scene and also the emergence of new occupations, like urban curators who walk around cities to map real time cultural or other interesting events that are taking place. A significant part of the discussion concentrated on the importance of brief daily encounters that form the basis for the shaping of a community and development of trust. The students pictured this in the example of flexible working spaces where people are able to work and network and profit from the interaction among people with different backgrounds, expertise and goals. After the lunch break, two groups were formed which were asked to develop two concepts applied to the building of the former Ministry and to study the social, political, economical and technological implications of their proposal. The first group developed further the discussion of adaptable pop-ups that would be hosted in this building. Instead of the typical model of crowdfunding, start up companies temporarily based here would be able to crowdsource tools, materials and skills among each other, transforming the building into a physical testing ground for new models of entrepreneurship. 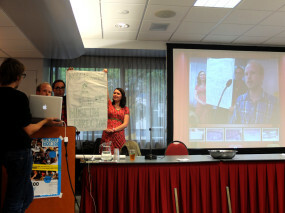 The second group came up with the idea of a museum where only real time information is displayed. They called it the “Museum of Right Now” and it would be a space, which would display real time information personalised for each visitor according to their personal profiles. We decided to move forward with this idea because of the interesting relation with the notion of government. The Ministry of Internal Affairs is the place where policy is centrally decided and from there it reaches out to the far off corners of the country, while in a “Museum of Right Now” it is the information that flows in from all distances and the building becomes a physical display of local conditions throughout the country. Regrettably, issues of privacy, control and accessibility were only barely touched as students tended to stay gripped by more exiting topics such as improving visitors’ experience with interactive elements, physical forms of information display and attracting diverse audiences. 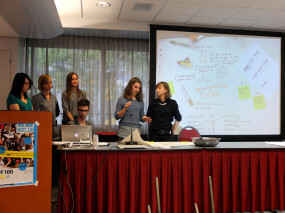 The day concluded with the final group presentations. As far as what the other groups came up with, AVRO spend their day interviewing people on the streets and suggested the transformation their new building into a “conversation cafe” where curated discussions between people would take place and would be later broadcasted. The Museum Studio proposed the interconnected nature of the viewing experience that could be stored in a cloud that would then enhance other people’s experiences and the introduction of “ordinary expertise” in the management of museums. The STT studio came up with the abolition of degrees and advocated for an education system based on “micro-certificates” in the fields of Arts, Technology and Science, which would integrate the expert, focused knowledge and the generalist, imaginative apprehension. Finally, DEAF group started by identifying the monoculture created by the internet and advocated that, as travelling is once again becoming more expensive, artists will become a kind of local specialists, which will redefine the ways they communicate their work.